It’s snowing. Like really snowing. It started at around 6:00 last night, while Barbara and I were enjoying yet another wonderful dinner at Angelina’s, our favorite Woodbury bistro. It’s the one place in Woodbury that rivals Hay J’s, our fave spot back out in Liberty Lake and Spokane. It snowed most of the night and it’s not supposed to end until 6:00 or so this evening. When we get these “snow events” (the technical term for the end of the world) we count on plows in multiple ways. The counties plow the interstates and main highways. The individual cities and suburbs plow their main arteries and surface streets. If a suburb isn’t large enough to have its own plow teams, they contract it out. The shopping centers and other places with parking lots hire independent contractors to clear the snow, ranging from guys in pickups with a blade attached to the front all the way to large private companies with fleets of machines. Finally, here in our subdivision the HOA hires a firm to do all the lawn care during the warm months and all the snow removal when it’s cold. By “all the snow removal” though, I mean a couple of things. 1) They don’t scrape it off at all unless we get more than 1.5 inches. 2) They do our driveways, walkways, and porches, along with the sidewalk. So what I’m getting at there is that the contractor will not come around to the back of the house to shovel me a walkway from the back door to the hot tub. C’mon, man. To this point, at exactly 12 noon on this Thursday Blog Day, we have not seen a plow in our little St. Johns Village enclave. As a matter of fact, I just saw the mail truck go by and it got stuck for a while at the next set of mailboxes after ours. I’ve never seen that before. He had to back up and try it again three times just to get going. Here in Woodbury, the city’s large fleet of plows concentrate on the main roads first. Then the secondary roads, like the ones we use to get into our development. They leave the little neighborhood roads for last. So we’re last. The HOA contractor has a limited set of resources, as well. We’re not the only HOA they work for. So, they have some guidelines too. If a storm ends in the middle of the night, they’re great about getting out here well before dawn so that everyone can get out to go to work. It’s kind of like peace of mind to be awakened by them at 5:00 in the morning. At least you know they’re working. But, when it’s a continuous snow storm like this one they like to wait until it’s over so they only have to do it once. I’m not sure what their plan is today (I’m no longer on the Board of Directors) but no sign of them yet. And it’s deep. And only getting deeper. Out in the western part of the start, it’s getting really bad. They have the same heavy snow but out there the wind has kicked up. They’ve closed I-29 north and south of Fargo, and now I’m seeing tweets from various counties that say they’re pulling their plows off the roads until this ends. It’s too dangerous for them to be out there when the wind is whipping things into “white out” conditions. Our forecast shows the wind picking up here too, later in the day. Hopefully it’s not that bad. And then there’s the whole issue of timing between the city of Woodbury and our contractor. It’s all about who comes first. When the city plow comes by, it pushes big mounds of snow toward the curb, which means we end up with a big mound of snow at the end of our driveways. That’s OK for a while, if the city comes first, because our contractor will clear that when they clear the drive. If the contractor comes first, they’ll clear the whole drive but the city will then throw the snow from the street right back on it. We have to go out there and clear that ourselves. These are the struggles we face. Now, back to better times. On Friday I flew down to Kansas City and then drove my rental car over to Independence. And once again I was reminded of just how far north of KC the airport is. We used to call it “Southern Iowa International Airport” when I lived there. I got to the hotel around 3:30 and then ventured out to find some provisions to stock my full kitchen at the Staybridge Suites, conveniently located about a minute from the hockey arena. Beautiful arena. Home of the KC Mavericks. 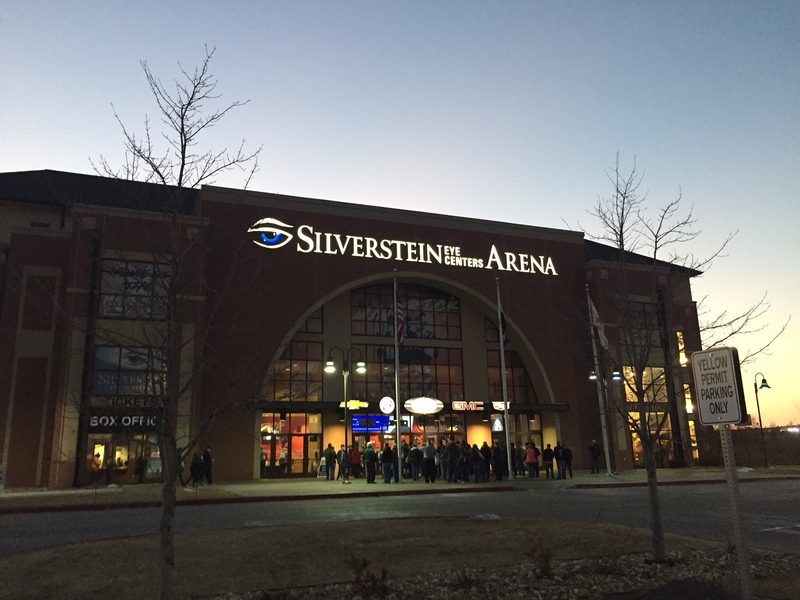 At 6:00 I headed over to the arena, which is title sponsored by Silverstein Eye Centers. The gates opened at 6:00 and I wanted to have time to pick up my tickets and my press credential at Will Call, and then find my friend Bob Rennison on the concourse. He doesn’t have to be at his broadcast position until around 6:40, so that would leave us time to catch up on things and do a tour of the building. It’s an outstanding arena! It holds a little over 5,000 but it has big wide concourses and lots of concession options. Feels like a major league place when you’re inside. I told Barbara that Bob should run for mayor. He is certainly the mayor of the arena when the Mavericks are playing. We walked up what seemed to be a dozen flights of stairs (probably more like eight, but you know) and at one point had to move a barrier that would let normal people know they shouldn’t go any higher. Bob is not normal, in any sense. Up to the top we went, and through a door that took us into a cramped space full of humming heating and ventilation equipment. Then to yet another door, but this was the key one. When opened, there’s a big ledge to step over, and then you are on the outside of the building. No, seriously. On the outside. On a walkway that rings the edge of the arena’s roof. And it’s dark out there. We walked on this very flexible bouncy material about half-way around the building, where we came to another door and another big ledge to step over. In there was the broadcast position, which Bob shares with camera operators and other assistants. When it was time for Bob to get on the air, I traced my steps back around the roof and down to the concourse. I was thinking I should’ve left a trail of breadcrumbs. I found my way to my seat, which was located next to two other seats and I had all three tickets. Why? That was done so that Alexa Jacobsen and one of her friends could sit next to me. Alexa, and all the other wives or girlfriends of the players, have passes to get in and usually just sit wherever they want, but this way we knew we could sit together in reserved seats. It was wonderful to see her! Geez, I’ve known her since she was 10, and she was as wonderful a young lady then as she is now. We cheered, we talked, and we caught up on everything during the game, which the Mavs won. Her boyfriend, CJ Eick, is really something to watch. He might be the shortest guy on the team, but he only has one speed, and that’s flat-out fast. He’s all over the place, buzzing everywhere and driving the other team nuts. He’s a great hockey player. I think I’ve written this before, but here it is again just so everyone understands. 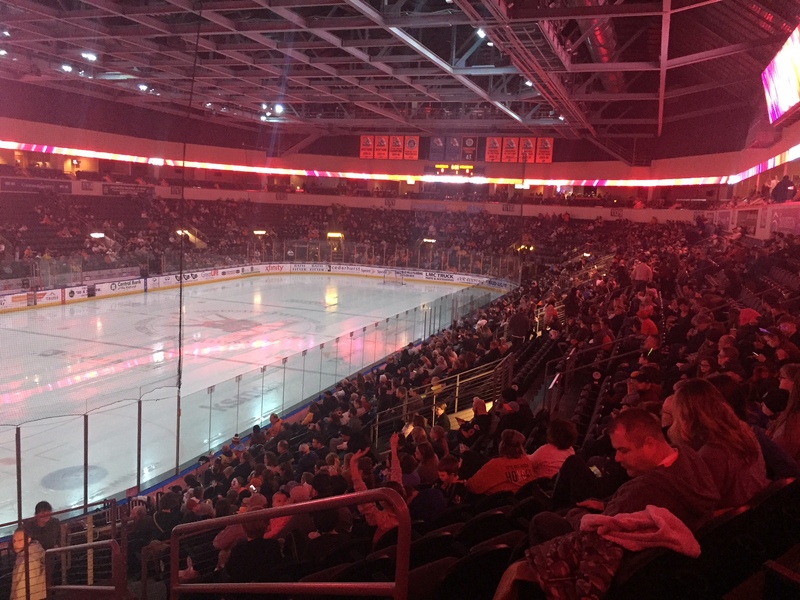 The Mavericks are a professional hockey team. They play in the ECHL, which is the equivalent of a Double-A minor league in baseball. They are an affiliate of the Calgary Flames. Should a player be promoted by the Flames, the top minor league team in the organization is the Stockton Heat, in the AHL. Any promotion from there would take you to the NHL and Calgary. On Saturday I met Bob for lunch, and once again a number of people in the restaurant recognized him. He also asked me if I’d like to come on the radio with him during the second intermission at Saturday night’s game. Sure I would! I was tempted to head over to the arena at 1:00 because the Kansas City Comets were playing an indoor soccer game, but I felt a bit of a cold coming on and taking a nap seemed like a smarter option. Yes, the building crew can make the switch over from hockey to indoor soccer and then back to hockey all within hours. It’s a pretty amazing process to watch, and in all my years working in arenas I used to love to watch the crew make the switch, or “change the house” as they called it. 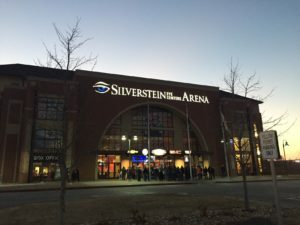 At the old St. Louis Arena, when I worked for the St. Louis Storm indoor soccer team, it was common for the building to go from hockey to soccer, and then to basketball, and then a concert, and then back to hockey, all in five consecutive days. And when the first fan would walk in for any of those events, they’d get the sense the place always looked like that. Somehow I survived the mountainous climb up all the stairs, and found my way around the ledge on the roof, in order to get to Bob’s spot. When he got his first break, he pointed me toward a headset and off we went. He had me with him on the air for the last 10 minutes of the second period, the entire intermission, and the first 10 minutes of the third period. It was great fun. Bob is such a pro. Like all announcers, he has charts in front of him to identify the visiting players. He keeps a running scoresheet to know how many penalties each team has and when goals were scored. And above and beyond all that, he just has the gift. He’s a terrific announcer and a great guy. It’s been my privilege to be his friend and mentor since 1994. I left the arena a little early, to beat the traffic out of the lots, and I also had to get back to the room in order for my next mission to be accomplished. About 30 minutes after the game ended, there was a knock on my door and Alexa and CJ were the ones doing the knocking. We proceeded to sit down and talk hockey and life for nearly two hours, while I kept my digital recorder going the whole time. The whole reason for the trip was to sit with these two and get an immersion lesson in the hockey lifestyle. All I had to do was say, “Okay, CJ. Let’s get started when you were a little kid, just learning to skate” and other than a few times when I asked him to clarify something, that was all I had to ask. Best interview ever. And a truly great time. From youth hockey up to high school, and the fact he actually left his home in Wisconsin to attend a high school in my home town of St. Louis, it all surprised me. 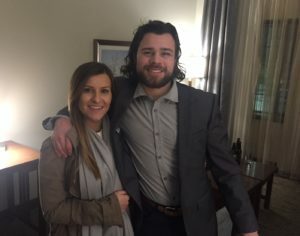 He then went straight into Junior Hockey, playing for the Green Bay Gamblers, living with a family and learning the ropes of being a full-time hockey player while not getting paid. From Green Bay he went to college, playing for Michigan Tech, a very fine program at a fine school on the snowy Upper Peninsula of the state, based in the town of Houghton. When his college career was over, he signed his first professional contract with the Utah Grizzlies, in Salt Lake City and in the same ECHL. They were an Anaheim Ducks affiliate. After about a year with them, he was traded to Kansas City in mid-season last year. Her answer was instantaneous. “It’s the uncertainty,” she said. Before she said another word I knew exactly what she meant. My mom dealt with all of that for 40 years, never knowing where Dad was going to be playing, or coaching, or scouting, but knowing that she’d be the one who would have to figure out what the Wilber family would do, and where we would go. My mom used to swear they once found out about a time my dad was traded by hearing it on the radio. It’s a great life in most ways, but it’s so uncertain, just like Alexa said. And the women have to be strong to cope with it. They are an amazing couple. So fun, so serious, so gracious. What a wonderful and valuable evening it was, and two hours flew by so fast I couldn’t believe it. My next door neighbor, who was a great hockey player in her own right, is all grown up now. What a fantastic woman she has become. Go Mavs!!! So, still not a plow in sight. Not on our little neighborhood road, not on the road that connects to the rest of the development, and not even on the big road behind our house. A few cars or trucks, but no plows. I just saw one neighbor outside shoveling their drive, but I’m only going to do that if I have no choice. After all, we pay HOA fees every month for stuff like this. Clearly they’re waiting for it to end. Keep an eye on things, Big Fella! 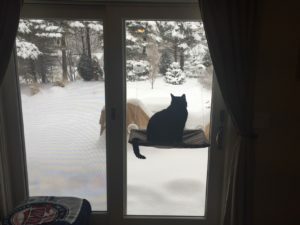 In the meantime, Buster is down here as my assistant and his job is to keep an eye on the snow and any little squirrels or bunnies that scoot by. He’s good at it for a while, but his attention span isn’t all that great. And I’m back. Well, AccuWeather can get confused at times. Right now their “MinuteCast” shows the snow ending in 100 minutes, so around 2:45, which is good. Their “Hour By Hour” though says it ends at 6:00. I tend to go with the MinuteCast because its based more on specific radar data. It was always my “go to” data spot when trying to figure out what the rain was going to do at the race track. I hope it’s right this time, like it usually was at the track. That’s it for this week. 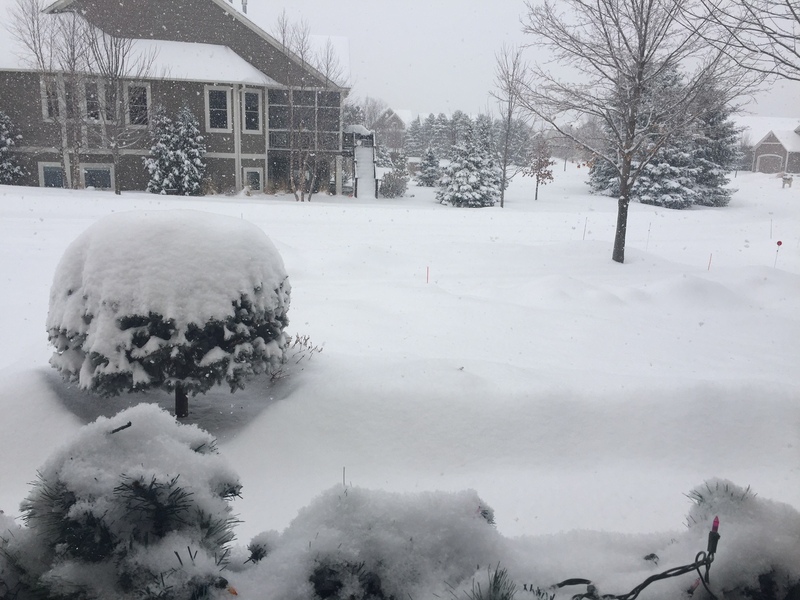 Hoped this rambling mess of info on snow, plows, Kansas City, Silverstein Eye Centers Arena, Bob Rennison, Alexa Jacobsen, CJ Eick, and more snow was enjoyable. As always, if you liked what you read please click on the “Like” button at the top. If I get enough “Likes” we can use them to pay the HOA contractor to do more plowing. I think. Not sure. Worth a shot! Maybe at least the part about the hot tub. Right? Bob Wilber, at your service and snowed in. PLOWING UPDATE! “Live” from “Plow Central” at 2:44 pm. Our little street has been plowed by the brave men and women of the Woodbury Plow Team. As noted above, that would be good news in terms of timing. Now, if our HOA contractor will show up and do the driveways, the city will likely not plow us back in, as long as the snow stops at some point. We march on! ANOTHER UPDATE! Just after I posted this, the Kansas City Mavericks published a fantastic story about CJ Eick. It’s a great window into what kind of man he is, and what kind of player he is. If you read it, I think you’ll see why I enjoyed our time together so much. He’s no stereotypical “dumb athlete” by any stretch. Check it out!